It’s not a magic trick and it’s not sleight of hand – scientists really are using levitation for a host of practical applications, like improving the drug development process, eventually yielding more effective pharmaceuticals with fewer side effects. Scientists at the U.S. Department of Energy’s (DOE) Argonne National Laboratory have discovered a way to use sound waves to levitate individual droplets of solutions containing different pharmaceuticals. While the connection between levitation and drug development may not be immediately apparent, a special relationship emerges at the molecular level. At the molecular level, pharmaceutical structures fall into one of two categories: amorphous or crystalline. Amorphous drugs typically are more efficiently taken up by the body than their crystalline cousins; this is because amorphous drugs are both more highly soluble and have a higher bioavailability, suggesting that a lower dose can produce the desired effect. “One of the biggest challenges when it comes to drug development is in reducing the amount of the drug needed to attain the therapeutic benefit, whatever it is,” said Argonne X-ray physicist Chris Benmore, who led the study. “Most drugs on the market are crystalline – they don’t get fully absorbed by the body and thus we aren’t getting the most efficient use out of them,” added Yash Vaishnav, Argonne Senior Manager for Intellectual Property Development and Commercialization. Getting pharmaceuticals from solution into an amorphous state, however, is no easy task. If the solution evaporates while it is in contact with part of a vessel, it is far more likely to solidify in its crystalline form. “It’s almost as if these substances want to find a way to become crystalline,” Benmore said. In order to avoid this problem, Benmore needed to find a way to evaporate a solution without it touching anything. Because liquids conform to the shape of their containers, this was a nearly impossible requirement — so difficult, in fact, that Benmore had to turn to an acoustic levitator, a piece of equipment originally developed for NASA to simulate microgravity conditions. Levitation or “containerless processing” can form pristine samples that can be probed in situ with the high-energy X-ray beam at Argonne’s Advanced Photon Source. “This allows amorphization of the drug to be studied while it is being processed,” said Rick Weber, who works on the project team at the synchrotron. The acoustic levitator uses two small speakers to generate sound waves at frequencies slightly above the audible range – roughly 22 kilohertz. When the top and bottom speakers are precisely aligned, they create two sets of sound waves that perfectly interfere with each other, setting up a phenomenon known as a standing wave. At certain points along a standing wave, known as nodes, there is no net transfer of energy at all. 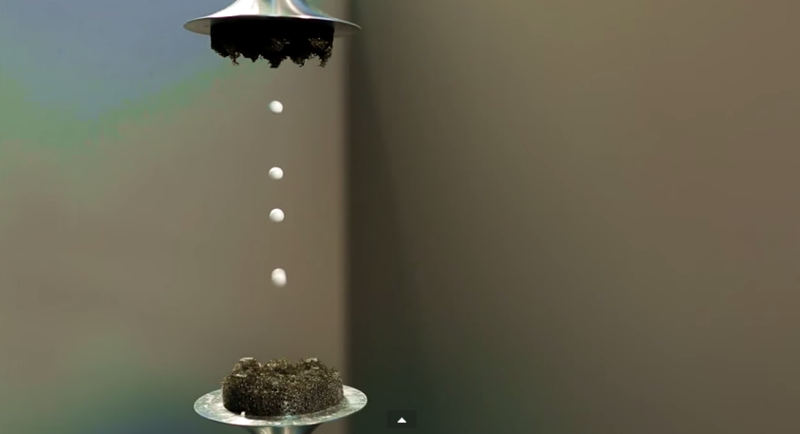 Because the acoustic pressure from the sound waves is sufficient to cancel the effect of gravity, light objects are able to levitate when placed at the nodes. Although only small quantities of a drug can currently be “amorphized” using this technique, it remains a powerful analytical tool for understanding the conditions that make for the best amorphous preparation, Vaishnav explained. Argonne researchers have already investigated more than a dozen different pharmaceuticals, and the laboratory’s Technology Development & Commercialization Division is currently pursuing a patent for the method. Technology Development & Commercialization is also interested in partnering with the pharmaceutical industry to develop the technology further as well as to license it for commercial development. After adapting the technology for drug research, the Argonne scientists teamed up with Professors Stephen Byrn and Lynne Taylor at the Department of Industrial and Physical Pharmacy at Purdue University and Jeffery Yarger of the Department of Chemistry and Biochemistry at Arizona State University. The group is now working on identifying which drugs the levitation instrumentation will impact most strongly.